Guess what I just put in our Toyota Highlander? A new cargo liner. When we bought our Highlander last winter, it came with the carpet cargo mat. This worked well enough in the short-term, but I wanted something better. While I’m a huge fan of all things WeatherTech, including their cargo liners, the 3rd row seating in the Highlander presents a unique challenge. Sometimes we have those seats up, other times they’re down. Toyota lists their cargo liner (pictured below) for $109.95, but you should be able to find it for around $85 (including S&H) if you shop around online. Related: To check current prices at Amazon, click here. Here’s a shot of what it looked like upon arrival. Next, a shot of it installed with the rear seats folded down. The cargo liner attaches to the carpet with little velcro discs that come with it. Finally, here’s another shot of it installed, but with the rear seats up. As you can see, the “accordion” section in the middle allows the seats to easily fold into an upright position while the liner remains attached. And that split in the upper portion? That accommodates the 60/40 split rear seat. 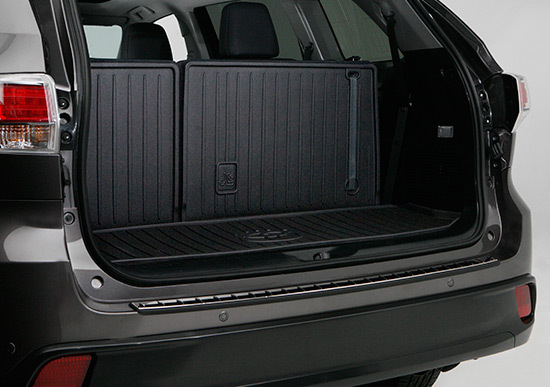 Thus, you can have one side or the other up/down without your cargo liner getting in the way. Interested? You can check it out here. The straps for raising/lowering the seats have a small velcro patch on the end. This lets you attach them to the carpet on the back of the seat. I would imagine that the holes let you do the same thing when the cargo liner is in place — the downside being that there are two extra holes in the liner for stuff to get through. Do I have to remove the carpet liner before I install the cargo liner?. Also, Toyota dealers can print out installation instructions as well.